The dental implant market was valued at about $6.4 billion in 2013. Despite the global recession, dental implants still saw strong compound annual growth rate (CAGR) of 7.8%. Although less than the double-digit growth shown leading up to the slowdown of global markets, the steady growth has been buoyed by very strong growth in the BRIC markets. The market is estimated to grow at a rate of 7.2% from $7.3 billion in 2015 to $10.4 billion in 2020. While dental implant presence varies from one country to another, its global penetration is still relatively low, but increasing annually. This is due to a number of reasons, the most important being the absence of reimbursement in almost every country and the cost of the procedure. However, this trend has begun to change, and an increasing number of U.S. insurance companies are covering the procedure. As there is a rising awareness among patients of the benefits of the permanent solutions offered by implants, there will be a greater willingness to invest in dental implants. 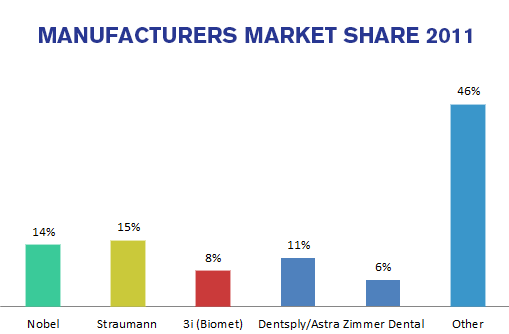 The dental implant market is undergoing tremendous growth. Increasingly, dental implants are being used as standard treatment for edentulous patients. The popularity of dental implants has been increasing exponentially ever since they were first endorsed by the American Dental Association in 1986. ANGULATION & PARALLELISM - Ensuring that each abutment is parallel to the other abutments used in a multi-abutment restoration can still present challenges. Parallelism is necessary to allow the restoration to fit passively and comfortably. Because conditions in the jawbone often result in implant bodies being placed at different angles relative to each other, each abutment must then compensate differently to achieve ideal angulation and parallelism. Currently either ideal bone placement or ideal angulation and parallelism is often sacrificed. FIXATION SCREW LOOSENING & FRACTURE - Chewing causes any implant case to undergo tremendous forces over its lifetime in the patient’s mouth. These forces can lead to loosening of the screws holding the case in place. This loosening can ultimately lead to screw breakage and case failure. HYGEINE/LACK OF RETRIEVABILITY - Many dentists are moving away from cementing as a method of securing abutments and implant components. Once implant bodies were being placed with a reasonable rate of success, a number of dentists took to cementing in components as it seemed preferable to screw loosening and breakage. As cement’s role in peri-implant disease (conditions which lead to inflammation and bone decay) has become better understood, many dentists are pushing away from cemented components even though a solution to screw loosening is still not available with current offerings of competitor products. These conditions remain the ones that dental technicians and dentists face every day, making many cases difficult to solve effectively. Until the advent of the EAS, there has not been a single system which allows an easy solution to all of the challenges outlined above. The EAS is a unique dental implant method that reduces the time and difficulty associated with implant restoration by providing full 360 degree placement of abutments for perfect passive fit and simple retrieval and maintenance for increased hygiene. Many small labs currently have trouble competing with the large well equipped labs because of the need to spend more time on restorations. We anticipate, and our pre-marketing research suggests, that the EAS will not only permit these small labs to quickly produce accurate restorations and remain competitive in their local markets, but also provide the dentist with a new solution to common problems. 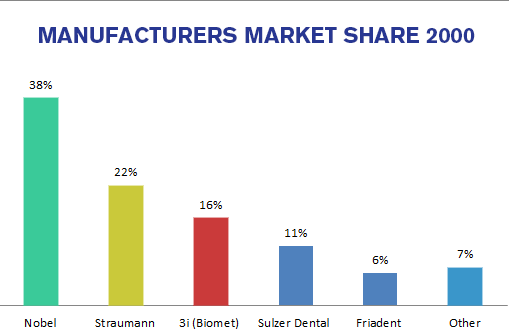 The two charts below indicate that the smaller innovative and independent manufacturers gained a considerable share of the dental implant market from the majors between 2000 and 2011. PDIC may be viewed as an attractive takeover target by a major as we increase our penetration in the industry. In addition, there are a number of product-specific factors that are unique to dental implants, which will contribute to the industry’s growth. Dental implants present the advantage of lasting for life, and therefore represent a cost-effective option on a long-term basis. Implant body and abutment components have the advantage of being standardized products, while bridges and dentures are customized. Dental implants bring a number of benefits to patients that traditional treatments such as bridges do not. For example, due to the osseointegration process (the fusion of the dental implant to the bone) and the similar tooth-root shape of the dental implant, this treatment prevents the bone loss and the gum recession that is associated with bridges and dentures. In addition, dental implants do not involve the support of the neighboring teeth, as is the case with traditional treatments. In today’s world, people are becoming more concerned about their appearance. Dental implants represent the more aesthetic option in tooth restoration, as they look natural.